It is known that gas giants around other stars are often located very near their sun. According to accepted theory, these gas planets were formed far away and subsequently migrated to an orbit closer to the star. Now, researchers from Lund University and other institutions have used advanced computer simulations to learn more about Jupiter's journey through our own solar system approximately 4.5 billion years ago. At that time, Jupiter was quite recently formed, as were the other planets in the solar system. The planets were gradually built up by cosmic dust, which circled around our young sun in a disk of gas and particles. Jupiter was no larger than our own planet. The results show that Jupiter was formed four times further from the sun than its current position would indicate. "This is the first time we have proof that Jupiter was formed a long way from the sun and then migrated to its current orbit. We found evidence of the migration in the Trojan asteroids orbiting close to Jupiter," explains Simona Pirani, doctoral student in astronomy at Lund University, and the lead author of the study. These Trojan asteroids consist of two groups of thousands of asteroids that reside at the same distance from the Sun as Jupiter, but orbiting in front of and behind Jupiter, respectively. There are approximately 50 per cent more Trojans in front of Jupiter than behind it. It is this asymmetry that became the key to the researchers' understanding of Jupiter's migration. "The asymmetry has always been a mystery in the solar system," says Anders Johansen, professor of astronomy at Lund University. Indeed, the research community had previously been unable to explain why the two asteroid groups do not contain the same number of asteroids. However, Simona Pirani and Anders Johansen, together with other colleagues, have now identified the reason by recreating the course of events of Jupiter's formation and how the planet gradually drew in its Trojan asteroids. 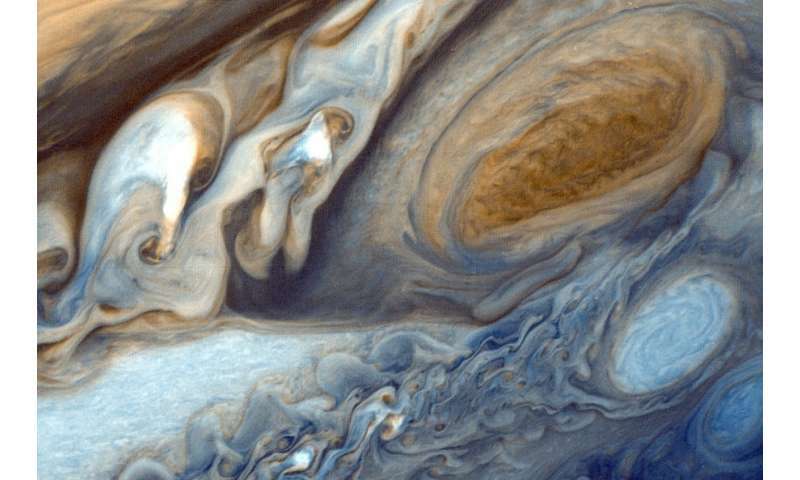 Thanks to extensive computer simulations, the researchers have calculated that the current asymmetry could only have occurred if Jupiter was formed four times further out in the solar system and subsequently migrated to its current position. During its journey toward the sun, Jupiter's own gravity then drew in more Trojans in front of it than behind it. According to the calculations, Jupiter's migration went on for around 700,000 years, in a period approximately 2 to 3 million years after the celestial body started its life as an ice asteroid far from the sun. The journey inward in the solar system followed a spiraling course in which Jupiter continued to circle around the sun, albeit in an increasingly tight path. The reason behind the actual migration relates to gravitational forces from the surrounding gases in the solar system. The simulations show that the Trojan asteroids were drawn in when Jupiter was a young planet with no gas atmosphere, which means that these asteroids most probably consist of building blocks similar to those that formed Jupiter's core. In 2021, NASA's space probe Lucy will be launched into orbit around six of Jupiter's Trojan asteroids to study them. "We can learn a lot about Jupiter's core and formation from studying the Trojans," says Anders Johansen. No sure how well this squares with previous migration models which have Jupiter forming at 3.5-4AU, moving inward, then moving outward to its current orbit. Not to knock this new model, but the only evidence they seem to be using is computer models of Jupiter's Trojan distribution, while the Grand tack hypothesis conveniently explains issues involving Mars' size, the depletion of the asteroid belt, and the small size of our terrestrial planets compared to those in other solar systems. Unfortunately, this article is pay-walled so whether or not they address this is unclear. The planets were gradually built up by cosmic dust, which circled around our young sun in a disk of gas and particles. Jupiter was no larger than our own planet. If "authority figures" continuously repeat a lie people will eventually believe it, thagg is how it goes with the utter failure of accretion guesses. It is known that gas giants around other stars are often located very near their sun. I wouldn't say that this is 'known'. Those types of exoplanets are just particularly easy to detect (which I would expect to skew the numbers quite a bit). Something as far out as Neptune around a far-off star is way harder to make out. Accretion models fail miserably at every turn. Not all people. That hurtful and dishonest tactic is/was the favorite of Donald Trump, the Republican party, and the Reich Minister of Propaganda of Nazi Germany Joseph Goebbels. No they don't, and there is no alternate 'theory'. Stop lying. The basic disagreement I have with the conclusions being drawn from these models? Is that the data used to simulate possible early Solar System planetary formations, are based om stars we have observed that are NOT Sol type stars. Why assume the same processes influenced Sol's planet's to be? Get me a list of observations from early G stars with a range of protoplanetary formations from debris disk to clear lanes. And them. let's evaluate the most probable self-structuring of this Solar System. & then, that would still be only a probability. Is that the data used to simulate possible early Solar System planetary formations, are based on stars we have observed that are NOT Sol type stars. Not quite. Exoplanets have also been spotted around plenty of G class stars, such as 61 Virginis, HD 102365, HD 147513, 47 Ursae Majoris, Mu Arae, Tau Ceti and our "neighbor" Alpha Centauri. HD 102365 and Alpha Centari are even G2V stars, exactly like the Sun (they're "Solar twins"). Tau Ceti is G8V-class, thus a bit smaller and cooler, but it is even more stable than the Sun. It is easier to spot exoplanets around red dwarfs because their small size makes it easier for both the transit and the "wobbling" method to detect planets around them. However new sharper techniques are developed and new space telescopes like the James Webb will soon join in on the action. As you might imagine astronomers want to focus on G stars like Tau Ceti. bobbysius, I agree. One theory I recall is part of the reason Jupiter got so big was that it was well positioned to draw in matter just outside the snow line. If Jupiter actually formed 4 times further out, could it have gotten as big as it is with much less material to draw from? You both make some good points. I haven't changed my mind of being skeptical of the value of the data for the models described in this article. I definetly want more data from Sol type & mass, single G stars before I am willing to form any conclusions about the subject of Jupiter's supposed historical perambulations. Mark, the reason I would disagree with your comment is because of the anomalies of Uranus & Neptune. For one thing, they mass greater than previous theories considered possible. If you see asteroid belt, then size distribution and gas distribution of outer planets then they indicate to single event connected to sun, which is not at least jumbling of the planet. Actually, accretion guesses have been dropping like flies recently. Simulations, fail. Observations, fail. Hypothetical guesswork, fail. And although there is in fact an alternative to the failed accretion guesses, that has no bearing on the validity of the accretion guesswork. Rubbish. They are observed. Stop lying. And there is no alternative. Link to it if you believe otherwise. Mark, definitely agree, there likely weren't enough building blocks at the proposed distances to get jupiter to anywhere near its current size. The paper does do a good job of explaining the anomalies in Jupiter trojans, but doesn't touch the Nice or Grand Tack hypotheses and that seems a big overlook, since this work is effectively contradicting them. So this is a big advance! As we now know from Ultima Thule, somewhat surprisingly, pebble formation works all the way out to where the Kuiper Belt Objects formed. The paper leans heavily on that physics, Johansen is one early promoter, and it explains the complicated sum of forming and disintegration mechanisms combined with infall speed towards a forming star that is maximized at the "meter size barrier (1,000 year infall)". Pebble swarms can form by turbulence beyond the snowline and they shield the disk "wind" until gravity takes over. The recent observation of Ultima Thule meant four or five tests of pebble swarms (swarm collisions to binary, gentle swarm collision to contact binary, binary objects were flattened by the original swarm rotation, object axis co-oriented by shared rotation, objects lumped of smaller objects). The paper show that all giants can form this way and migrate inwards in a Grand Tack route but now with known large distances and short times, the originating distance explaining the albedo and spectra of the Trojans as same as KBOs. The short time and migration direction explains the Trojan asymmetry and Mars being a runt as in Grand Tack. It is also consistent with the majority of other planet systems where planets end up in resonances after migration. We know that in our case the planets migrated slightly again - in this paper they get it was out - the 10 % larger orbit of Jupiter explaining the closest asteroid disk features (the Hildas) and Neptune explaining the inner cut off of the Kuiper Belt. The paper offer two hypotheses, one that the disk was still filled with planetoids and the other a possible delayed Jupiter-Saturn resonance as in conventional Grand Tack and Late Bombardment, but in both cases quick on the order of in-migration time. To sum up, this is no less likely than Grand Tack but it is now also consistent with both other systems and with formation theories. Personally, seeing how Late Bombardment is a theory in trouble [ https://www.natur...-01074-6 ], I think it also adds a natural (more likely) out-migration model and that too can be consistent with systems having wide orbits. Ironically a good indication of Grand Tack trouble and that out-migration was early is a close Trojan binary. Having many such captured during Jupiter in-migration is not a problem, but to have one left after 4 billion years means the disk had to place the planets and disperse within 100 Myrs [ https://www.natur...8-0564-3 ]. Oops, too late to edit but I meant Late Bombardment trouble. And that Jupiter migrated slightly again, the other outer planets correspondingly more. Neptune migrated several au's (from 20 to 30 in the new model). No, nope, no_sense. I do mot see any sort of mechanism that explains the present stability of our Solar System. Based on a helter-skelter speculation of planets rampaging back & forth from one end of the Solar System too the other. Then suddenly, all that cosmic pinball action comes to a screeching halt? Perfectly positioned for today's orbits about the Sun? Without disturbing the delicately balanced structure we observe of Ultima Thule? I do not buy this fabulist hypothesis for a minute. "Hell! I won't even rebt it for the weekend!" CONSIDER: The mass-distribution of planetary-material is re-configured again AFTER the central body (proto-star) attains sufficient mass/heat of compression to initiate main fusion which in turn creates a 'nova' with polar-jets and strong 'wind' of material shed by the new star in that final formation stage. Hence whatever the initial accretion disc configuration was re density-rings, the new star's strong RADIATION and FAST PLASMA WINDS ***plus*** newly formed strong MAGNETIC FIELDS will RE-shape the remain disc material into RESONANCE STRUCTURES reflecting the interplay between all the strong factors which would not have been active/dominant in the initial coalescing cloud/disc material. It's not as simplistic as models made it seem until now. In short: the chaotic interplay of these newly strong factors in star's final stage of formation will result in a distribution of variability in the re-shaping of remaining dic material and newly forming proto-planets etc. Complex. you left out the trivial detail of 4 billion years. Why would you even bother mentioning such an unimportant allotment of Time? & it is amazing, truly a fabu;ous phenomeba! That only you looneyticks are able to observe magical plasmicspastic electraglideinblue & etherhuffingaethernut events. Completely missed by tens of thousands of professional astronomers over the last couple of hundred years. & missed by hundreds of thousands of amateur astronomers. & missed by hundreds of millions of just plain people who looked up intp the night sky without your cults permission. How dare they contradict your asininity of anti-intellect? Asteroidal asymmetry aside, if stellar binaries form mostly from gas, why couldn't a sub-stellar object form by the same process? If this did occur, it would certainly be able to form a core as it evolved from a "gas giant" (reverse process). Should also retain a gaseous atmosphere despite "ignition" of its host star, assuming enough gas had been bound to a sufficient core "pre-ignition", and the planet's distance were far enough from the star. If stellar "ignition" were going to destroy a gaseous neighbor during its formation, wouldn't there be fewer stellar binaries? Yet they make up the majority of stars. Some are even contact binaries, mixing their atmospheres. Does anyone know if this close proximity is primordial or evolutionary? Difficult to imagine that many binary stars light up at the same time. That was already long since understood regarding the longterm gravitational interplay of the planets once they formed from the dust/gas/plasma accretion disc. My post above just pointed out the effects of the star-forming process per se; in re the question of density-distribution canvassed by some above. I pointed out the pre 'star nova' stage and post 'star-nova' stages were very different as far as the accretion disc/density distributions etc were concerned. Please leave out the silly personal/insults crap, mate (especially since I did not attack you in any way above. Just try harder to stick to the science/logics and the context in which posts are made. Thanks. @RealityCheck, sadly your requests for civility on this site are in vain. Most people it seems like to insult other posters. They seem to thrive on it Perhaps is gives them some sense of superiority when all it does is drive their credibility down. All the juvenile claims of liars and lying liars makes a mockery of so many threads. I have never encountered such a thing in all my years in science. There is nothing to be done about it. On the subject, how does your notions relate to binary star formation? Wouldn't the first one to ignite limit the size of another in its pre-ignition phase, depending on distance and size of the initial star. We were mainly interested on the effects such large-scale migration could have on the small body populations of our solar system in the first-order resonances with Jupiter, such as the Hilda asteroids and the Trojan asteroids. The word "Nice," as in Nice Model, was not found by a word search of the article. This absolutely is ignoring the elephant in the room. "(The NIce Model's) success at reproducing many of the observed features of the Solar System means that it is widely accepted as the current most realistic model of the Solar System's early evolution"
dfj, you fail to understand that looneyticks like RC are not astronomers or cosmologists or basically any type of scientist. If the woomongers were allowed out at night? Some one would have to point up into the sky as to the direction they would need to look to see the Moon & Stars. You think I'm being insulting to these dear children of inbred cretins? You need to consider the malicious intent of these vermin to disrupt civil discourse & discredit scientific research. If you are not one of that bugswarm? They are your enemy. Deniers, antivaxxers, swindlers, woomongers of EU, YEC, DU, & a multitude of other bunco artists schemes & fakir cults. Whenever, you are foolish enough to allow any of them into your presence? Before you let them out the door? Be sure to retrieve the silverware & your wallet! Uhmm, your car is insured? You have kept up with all your inoculations for communicable diseases? Quite right, that is the model name. I was only obliquely referencing it by Grand Tack, since it is a central process in the Nice model. And the article is cutting out a lot of the context, results et cetera, likely the university press group decided to simplify (and it was effective, popular media is spreading this widely). I do mot see any sort of mechanism that explains the present stability of our Solar System. It is not trying to explain the system orbit mechanism, which is Keplerian planetary orbits of course, other than as the end result. Read the paper and consider what it*is* about. Also, be advised that the system to our best of modern knowledge is chaotic, not stable but "marginal stable". ... The main surprise that comes from the numerical simulations of the recent years is that the probability for this catastrophic events to occur is relatively high, of the order of 1%, ... What is more surprising is that if we consider a pure Newtonian world, starting with the present initial conditions, the probability of collisions within 5 Gyr grows to 60%, which can thus be considered as an additional indirect confirmation of general relativity." @RC, sadly your requests for civility on this site are in vain. Most people it seems like to insult other posters. They seem to thrive on it Perhaps is gives them some sense of superiority when all it does is drive their credibility down. All the juvenile claims of liars and lying liars makes a mockery of so many threads. I have never encountered such a thing in all my years in science.. It used to be even worse in the past and in other (now-defunct due to trolling/insulting, and 'bot-voting wars' in ratings pages) sites. So any improvement is better than none. One must have faith in the enlightening effect of constant vigilance/exposure/example-setting of/for those not brought up with our sense of objectivity/fair-play, hey! reflecting the interplay between all the strong factors which would not have been active/dominant in the initial coalescing cloud/disc material. So, same as I would say that a false claim is an unwitting "lie" and the technical term for those who know or wo should know that they are peddling falsehoods are crackpots (as measured by the crackpot index). I would say that the emblematic SHOUTING type of those people is also not nice. @dfjohnsonphd, you fail to understand that looneyticks like RC are not astronomers or cosmologists or basically any type of scientist. If the woomongers were allowed out at night? Some one would have to point up into the sky as to the direction they would need to look to see the Moon & Stars. You think I'm being insulting to these dear children of inbred cretins? You need to consider the malicious intent of these vermin to disrupt civil discourse & discredit scientific research. If you are not one of that bugswarm? They are your enemy. Deniers, antivaxxers, swindlers, woomongers of EU, YEC, DU, & a multitude of other bunco artists schemes & fakir cults. What we ordinary persons that do not lend ourselves to crackpot trolling lies and non-niceties should not do is to personal attack these lying bastards. Let them show the rest of us what amazing though irritating and dangerous (demotes facts and science) traits people can have. you DO NOT DISCERN between those who ARE woomongers and those who ARE NOT (eg, ME). Please actually address the "considerations" offered in my post from which you quoted; and cease and desist your own trolling/personal insults instead of addressing the science in question. Moreover, please understand that posters may use CAPITALS on this site for EMPHASIS etc; because NO BOLD/UNDERLINE etc 'highlighting' options are available here. So it's NOT SHOUTING if you bother to read me IN CONTEXT, ok? As for discerning between woomongers and NON-woomongers, please take the trouble to UPDATE YOUR OWN OPINIONS BASE to reflect that I am the one being confirmed correct by mainstream discovery/reviews on many fronts; and NOT YOU, or those others who troll/insult me without cause just because I am correct and they not so. @RealityCheck, you have me reading up on clouds that form stars and this is a wild field for study. Density and temperatures are so variable and enormous in their effects. Massive clouds forming thousand of stars. Quite remarkable. Haven't looked at most of this stuff in years. W = 7 km/s (northwards out of the plane of the Galaxy)"
What might have imparted this momentum to our solar system since much of what I am reading (simplified) suggests "static" collapse? well RC. im order for me to personally attack you? You'd first need to get a personality. Actually I am attacking your programmer at their Dark Web site. That you are a russianbottroll or a saudibottroll is irrelevant. You future-convicts-in-training (from my lips to the god's ears) may each have your own criminal specialties. But you all look the same in prison stripes! well RC. im order for me to personally attack you? You'd first need to get a personality. Actually I am attacking your programmer at their Dark Web site. That you are a russianbottroll or a saudibottroll is irrelevant. You future-convicts-in-training (from my lips to the god's ears) may each have your own criminal specialties. But you all look the same in prison stripes! Right there, mate, you just blew your 'cover'. You're an insults troll who indiscriminately trolls/insults and mis-associates me with others, regardless of those others' own status. By now you should know full well who I am: a strictly independent, objective science/tech/cosmology researcher working on my own independently-derived ToE. Your 'mates' already knew this because they know who I am. So, @rrwillsj, you are not only a tragic internet troll pretending to 'defend science' as 'cover' for your nastiness, but also a nincompoop without a clue as to whom he is trolling. Grow up, @rrwillsj. @RealityCheck, your posts on evolution of stellar systems have been interesting and inspired me to look into it. I should point out however that you appear, at least to me, to be evolving into the very poster who you revile. You have asked for courtesy, and received none. There is an ignore button. If you use it, you might find a recent post from me that I would greatly appreciate a response to! Thank you kindly in advance, mate! rrwillsj often starts to get things right, then veers wildly into nearly incomprehensible comments and/or goes completely off topic, especially if you agree with him. Maybe he can explain this behavior. It seems like we should be civil and in agreement more often than we are. I am not sure why he is going off on RC here, but maybe RC was correct when you wrote he is not doing a good job discerning who is who. For example, we can debate the nuances, but RC's comment that solar systems evolve when their suns get fusion going seems to be mainstream science to me and on very solid ground. @RC, your posts on evolution of stellar systems have been interesting and inspired me to look into it. There is an ignore button. Unfortunately, the IGNORE option is not a 'luxury' I can indulge in (no matter how tempting! it may be); as it is not conducive to my (main) function here (the clue is in my username: RealityCheck). I cannot do that properly, objectively and in a fully informed manner if I just ignore those who most need the reality checks, can I? Besides, the problem is wider than that; it is about all the nastiness, bot-voting, trolling etc CAMPAIGNS which a certain 'gang' here has been waging AGAINST proper, polite, objective science discourse here (and in other forums now defunct because of same campaigns) which must be confronted/exposed. ...find a recent post from me that I would greatly appreciate a response to! @RealityCheck, there are about 7.3 billion people on the planet, and you are not going convince very many of them, much less of the crowd here, by your posts. Most will continuouly prove their ignorance ad infinitum. The ignore button will set you free, mate! Take that giant leap for mankind! @RealityCheck, there are about 7.3 billion people on the planet, and you are not going convince very many of them, much less of the crowd here, by your posts. Most will continuouly prove their ignorance ad infinitum. The ignore button will set you free, mate! Take that giant leap for mankind! @RealityCheck, it seems also that you are likely doomed by your username/duty to miss out on the luxury of exchanging ideas of the subject matter at hand, clearly a more important application of your time. Sorry to have bothered you, mate.